The Barren Island volcano, India’s only live volcano, is once again active, scientists working for the National Institute of Oceanography who witnessed the volcanic activity in January said. 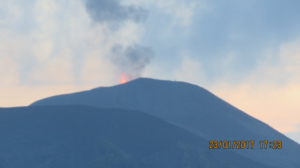 The Barren Island volcano, located 140 km [about 87 miles] Northeast of Port Blair, dormant for more than 150 years started erupting in 1991 and has since then shown intermittent activity," CSIR-NIO said in a statement on Monday. "The volcano was erupting in small episodes lasting about 5 to 10 minutes. During the daytime only ash clouds were observed. However after sundown, the team observed red lava fountains spewing from the crater into the atmosphere and hot lava flows streaming down the slopes of the volcano." "The volcanic island is uninhabited and the northern part of the island is, as the name suggests, barren and devoid of vegetation," CSIR-NIO said. A 6 km (20 000 feet) high ash plume drifting 120 nautical miles to the southwest was reported last night.